Certified Performance Pro is a certification that will help you build the foundation to become an expert New Relic APM user. As a New Relic Certified Performance Pro, you’ll be a verified authority on how to effectively monitor and troubleshoot application performance in your digital business. 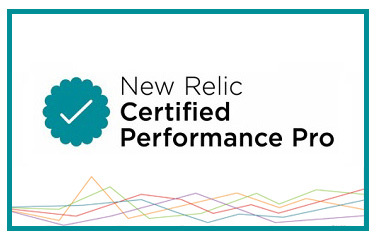 Become a New Relic Certified Performance Pro! Certified Performance Pro is a program that will help you build the foundation to become an expert New Relic APM user. Once you pass the certification assessment, you’ll gain an official New Relic Certified Performance Pro certification and shareable badge (issued through Accredible) which you can use to promote yourself to relevant communities, on LinkedIn, and beyond. As a New Relic Certified Performance Pro, you’ll be a verified authority on how to effectively monitor and troubleshoot application performance in your digital business. New Relic certified practitioners get a shareable NRU certificate and badge to highlight your skills, special flair when posting on our online Technical Community, and more benefits to come! If you're ready to take the test, you can go right to the test by registering for the Certification Test and get on your way to becoming a Certified Performance Pro! The New Relic Certified Performance Pro certification is intended for individuals who want to solidify and showcase their New Relic skills with a baseline certification in application performance management. Let's get started together. We're going to take you through the basics to manage your application and services. Learn how to navigate New Relic APM UI and interpret chart data so you can improve your application's performance and troubleshoot complex applications faster. Learn how to use the New Relic platform Alerting tool to monitor performance and know when leading performance indicators spike or drop so you can catch problems before they reach your end user. Enable team members to get the alerts they need faster and achieve lower response times. Learn how to use the New Relic platform to monitor the performance, dependencies, and bottlenecks of your entire stack in real-time. Learn how to use New Relic Insights to analyze and present custom, real-time data visualizations. Learn how to add and interpret Custom Instrumentation and Custom Metrics for a more complete picture of your app’s performance. Use the New Relic REST API to create customized queries on metric data and use deployment tracking to understand changes in your app pre- and post-code release. Ready to take the test? Pass the certification assessment and get an official New Relic Certified Performance Pro certification and badge to share on LinkedIn, and beyond. We couldn&apos;t find the page you requested. If you got to this page with a bookmark or link, you can still find all the same great content. It has just moved to a new location. To see all the exciting changes we&apos;ve made to New Relic University, please visit this site&apos;s home page. Looking for live and recorded webcasts? They&apos;re still here. Just click the link in the banner above! If you were trying to get to the "Intro to Infrastructure" Course or a specific tutorial in that course, you can find it by going to the new course, Getting Started with Infrastructure. You can also find a tutorial about Health Maps in the course Performance Monitoring with New Relic. If you are trying to get to a Private Group course, you need to make sure you are logged in using the same email address you were invited to the course with. If you have any further trouble accessing the course your were invited to, email us at reply.nru@newrelic.com.